Over the years we’ve had Lego games aplenty, from the worlds of The Hobbit and Harry Potter realised in coloured bricks we know and love, to the likes of Batman and Indiana Jones. It’s tough to think of a movie series that doesn’t have a Lego game attached to it. While Star Wars: The Force Awakens debuted in cinemas late last year, its brick-filled, digital equivalent is only available right now, on every platform, including the PS Vita. Lego Star Wars: The Force Awakens follows the events of the film quite closely, although it starts off with the end of Return of the Jedi. One might assume that this was done to give some context to the Force Awakens, but considering that there was an entire game devoted to the original trilogy, there’s no reason for this. Well, aside from padding the game’s content. And pad it does. Much like Lego Marvel’s Avengers, scenes of the movie are liberally replaced with filler sections. These include trying to open the Resistance base door or gathering supplies for the Millenium Falcon. 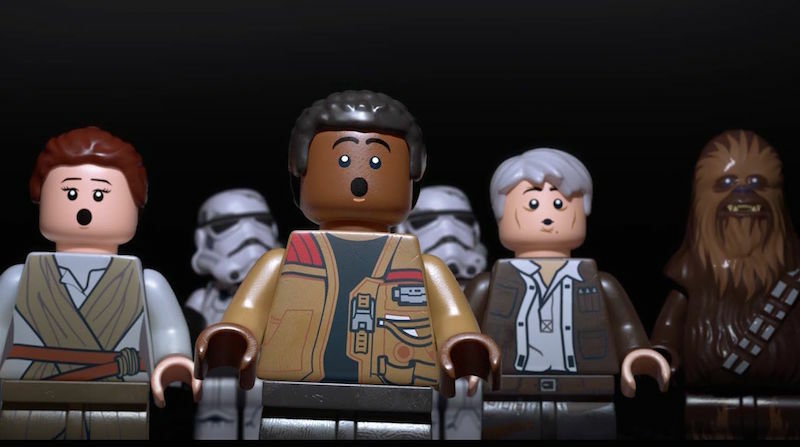 Lego Star Wars: The Force Awakens manages to eke out around six to eight hours from a two hour and 15 minute movie. For most part it follows the long-running formula of many a Lego game. You’ll solve a few puzzles, shoot some enemies, and jump across a couple of platforms. All of this is par for the course, as it has been since the inception of these Lego games in 2005. The boss battles with their quick-time events force you to press the displayed button within a rather generous duration. The result would be a game that’s highly monotonous, if it were not for two additions to gameplay. In Lego Star Wars: The Force Awakens, there are segments that allow you to hide behind cover and gun down foes akin to Gears of War, and you can also fly the franchise’s ships in combat. Both sport intuitive, responsive controls, and add a sense of variation to a series that’s largely worn out its welcome. When the game was leaked a few months ago, it was touted that the game will “feature exclusive playable content” to fill in the gap between Star Wars Episode VI: Return of the Jedi and Star Wars: The Force Awakens. These would expand on incidents mentioned or left out of the movie. Some of these missions are memorable, such as Admiral Ackbar being rescued by Poe Dameron, or the origins of how Han Solo and Chewbacca got tentacled beasts onto their cargo ship. Others such as playing Lor San Tekka (the old man from the beginning of the movie) are sleep inducing. Although we weren’t convinced that having blocky characters show off unseen plot points is a good idea, the execution is effective enough to get the message across. With six post-game levels to unlock, experiencing all of them becomes an effort in itself. To access them, you’ll need a lot of Gold Bricks that you have to take on side missions or replay main missions to find and collect. We can’t help but feel that instead of locking the additional content to pad game length, this would be a better game if it was all available right after completion of the main story. So if you’re looking for your fix of Star Wars, Lego Star Wars: The Force Awakens might keep you occupied. Unless you’ve played any game in the Lego series prior to this. Recommended for die-hard Star Wars fans and newcomers to Lego games only. New gameplay mechanics add variety. Expands on Stars Wars lore. Accessing post-game content can be painful. More of the same for most part. 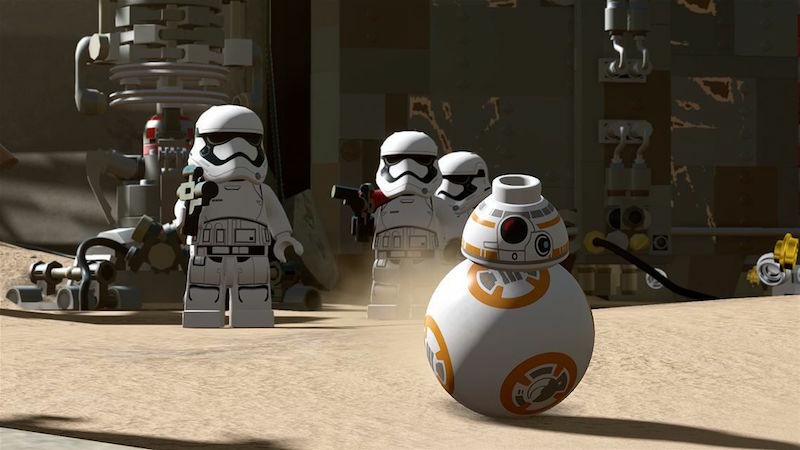 We played a review copy of Lego Star Wars: The Force Awakens on the PS4. The game is available on the PC, PS3, PS4,PS Vita, Xbox 360, and Xbox One. It costs Rs. 499 on PC, Rs. 1,799 on PS Vita, Rs. 1999 on PS3 and Xbox 360, and Rs. 2,499 on PS4 and Xbox One.